The children touched my heart in a way I can never explain in the right words. 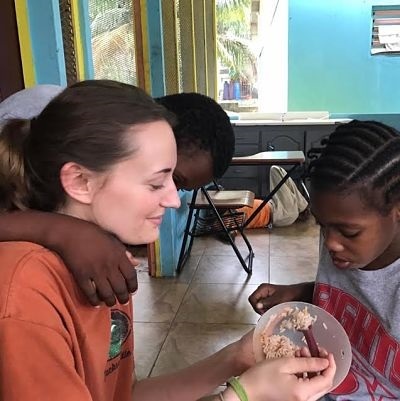 "The eight days I spent at Blessed Assurance in Montego Bay, Jamaica were by far the most inspirational days I have lived to see so far in my lifetime. Each child I was blessed to meet there was so extremely beautiful, smart, and loving. The children touched my heart in a way I can never explain in the right words, but in short- they changed my view on the world. Each child is blessed with different talents and people tend to forget that even with a disability, these talents are just as pure and extravagant. Each child at Blessed Assurance was remarkable in his or her own way and proved that neither the color of your skin, nor the way you were born affects the way you can share love and acceptance throughout your lifetime. The children were not the only ones who changed me, the caregivers were extraordinary as well. Each caregiver showed immense respect and unconditional love for the children at Blessed Assurance. I have never seen so much love and acceptance in one place at the same time. I have missed every child I met there everyday since I have returned back home. It is easy to get caught up in a busy life with material items, but the relationships I created with these children will be with me for my lifetime. I am so very thankful that I was given the opportunity to spend time at Mustard Seed Communities."